After a somewhat successful league finish last time out (you can read about last season here) the board once again asked me to avoid relegation for this season but I have higher expectations. My plan was to once again finish in the Championship group and achieve a higher place finish than the 7th which we managed last year. In addition to this, I’m also hoping to progress further in the cup than we did last season, as you know if you read part one of this series we were defeated in the very first round by second-tier opposition. The quarter-final is probably my realistic target for the cup this season! I only made two new signings for Gornik Zabrze this season. This was mainly due to the financial restrictions at the club – we will discuss this later in the post. My first signing was Bosnian winger Stjepan Vego on a free transfer, he is a very good option out on the left wing and at just 21 years of age I expect him to keep on improving over the years to come. The next signing I made was a Polish right back named Marcin Wasielewski. Last year we signed German Paul Stieber but he hasn’t progressed as much as I would’ve liked so once again I was in the market for a backup/starting fullback. I believe that Marcin will be a decent option and he must have some quality about him with him previously being at Lech Poznań. Now for the outgoings, as I mentioned money is hard to come by at the moment so I tried to move on a few players to improve the clubs situation. Notable exits included Szymon Matuszek for £75k, Marcin Urynowicz for £20k and Rafal Wolsztynski for £15k. In the end, after another couple of sales, we made around £135K this season. A fair bit of income! In terms of newgen day there was only really one guy that stood out for me – young Polish winger Dariusz Pach. At just 16 years of age he already has two and a half stars of current ability and five stars of potential ability. I have now promoted him to the first team and he is being tutored by Spanish veteran Igor Angulo. I feel like I should start off with something I am extremely proud of and I gave a sneak preview of this on my twitter so if you’re not already following it’s certainly worth heading over there! So, Gornik Zabrze have won the Polish FA Cup! Yes you heard me right we have won the cup. I am so happy with this achievement, a bit of luck and also a stand out from performance from young Mark Antkowiak gave us a phenomenal 5-3 win over Lechia. Thanks to this we will enter the Euro Cup in the second qualifying round next season, financially permitting of course. Now to the league. 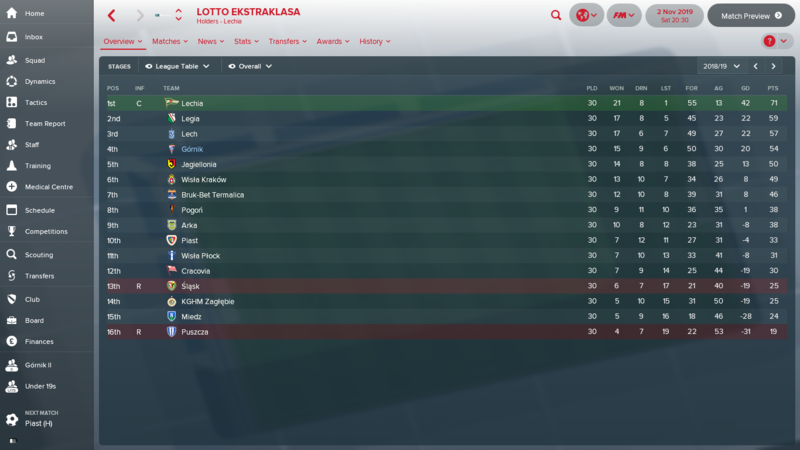 After 30 games played we finished in 4th position which I was very pleased with, but to my surprise we finished a total of 17 points behind Lechia who have come from absolutely nowhere to dominate the league this season. This means that once again we qualified for the Championship group for the second part of the season. Overall we finished in 5th in with a record of seventeen wins, 10 draws and 10 defeats. We also finished with a total of 61 points which actually equals Gornik Zabrze’s record points tally! Once again we have exceeded expectations in the league and I hope we can continue to do so next season. Midfielder Rafal Kurzawa won LOTTO Ekstraklasa goal of the season for his superb strike against Lech on the 6th May. Once again I was shortlisted for manager of the year but I thought that there was no way that I was going to get this title over Lechia manager Piotr Stokowiec, who lead a team that finished 9th last season to a title win and a convincing title win at that. 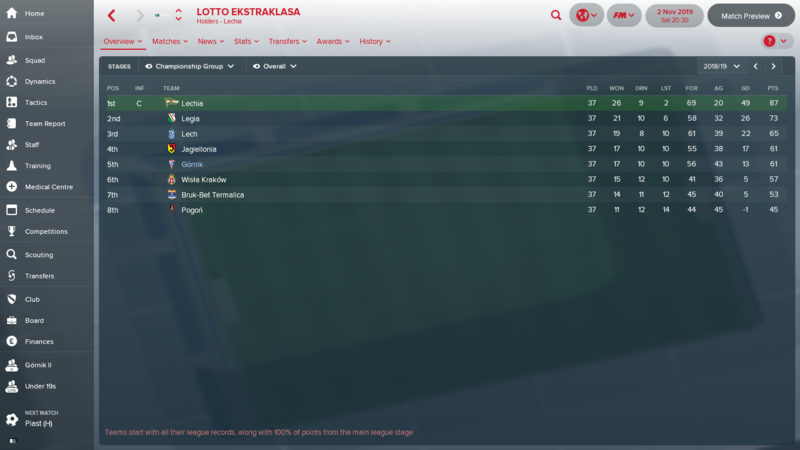 But to my surprise I have done it, I am the LOTTO Ekstraklasa Manager of the Season, I cannot believe it! Player of the season was voted as Slovenia midfielder Erik Grendel, although he had a fantastic season I have to say that I disagree with this and I believe that right-sided winger Mark Antkowiak, who has earned a place in the Poland squad for the Championships in the summer, deserved to win. ‘The club is in £50 million worth of debt, this is an unsustainable financial position and if extra funds cannot be found then the prospect of the club entering administration in the near future is a real possibility’. This has never happened to me in any of my saves before and to be honest it may put the future of this series in jeopardy, however I am hoping that with the potential of us qualifying for Europe we can garner some extra income and save this club from administration. Finally, the LOTTO Ekstraklasa has moved to 19th from 21st in competition reputation rankings above notable leagues such as the Ladbrokes Premiership. However, we remain behind some of the lesser known leagues such as Greek Superleague. So that’s it for Part 2 of my Rebuilding Gornik Zabrze save in the 2018/19 season. I hope that you enjoyed this post and if you have any suggestions for this save moving forward then please do comment below or head over to my Twitter @Casual_FM_. Once again thank you for taking the time to read this post! This post was written by Casual_FM_. Do leave some comments below if you have any thoughts about this new save with Polish club Gornik. 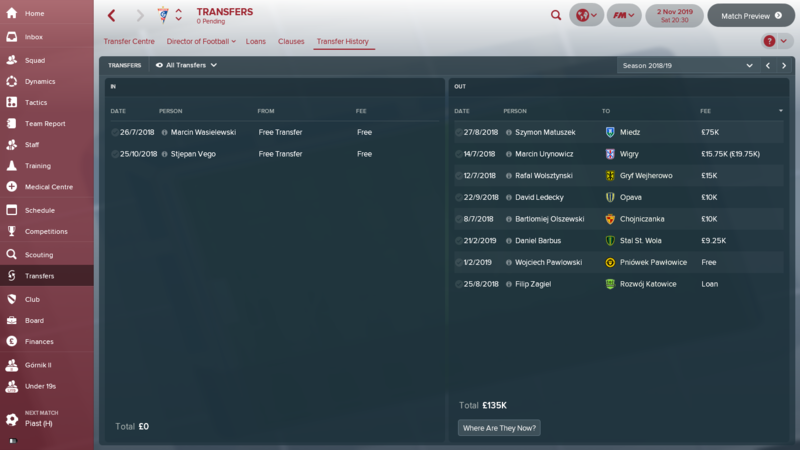 Have you managed in Poland on FM before? And be sure to follow Casual_FM_ through his Twitter linked above. This entry was posted in FM18 Stories, Football Manager 2018, Gornik Zabrze | @CasualFM and tagged fm stories, fm18, football manager, Gornik Zabrze | @CasualFM, poland, polish ekstraklasa. Bookmark the permalink.